If desired, heat taco shells as directed on box. Heat 10-inch nonstick skillet over medium-high heat. Add chicken, gingerroot and garlic; cook 3 to 5 minutes, stirring frequently, until lightly browned. Stir in soy sauce, honey, onion and pepper flakes to coat. Reduce heat to low; cover and cook 5 minutes, stirring occasionally, until chicken is no longer pink in center. 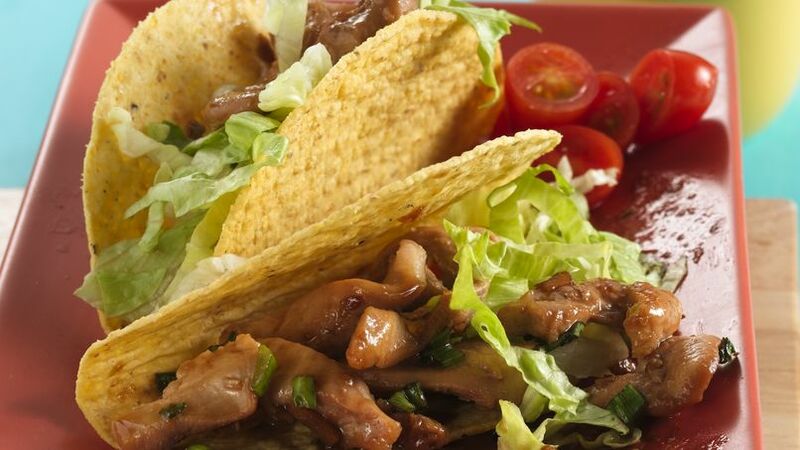 To serve, place slightly less than 1/4 cup chicken mixture in each taco shell. Top each with lettuce. Serve immediately. To make this quick recipe even quicker, cut up the chicken and veggies the evening before or the morning of dinner. Cover tightly and refrigerate until needed.